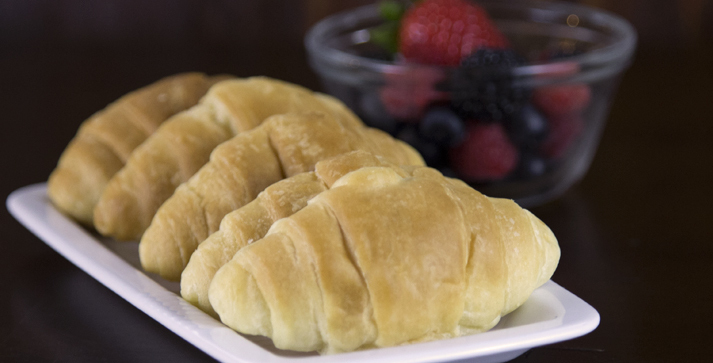 Toufayan Mini Croissants are the convenient way to add a delicious bread treat to any occasion. They are ready to serve out of the bag and are a great complement to soups, salads and dinner entrées, as well as wonderful for breakfast with jelly or jam. They’re also a wonderful party tray option for guests to enjoy. With 24 Mini Croissants to a package, Toufayan Mini Croissants are versatile and a welcome addition to any meal occasion. Where can I purchase your mini croissants in Birmingham, Alabama? Need them for a wedding shower on Sunday. Thanks for your interest. In Alabama, you can usually find Toufayan Mini Croissants in AG, Bi-Lo, Kroger, Piggly Wiggly or Publix. Each store manager may chose to stock them, so if you don’t see it, please ask the store manager. We hope the wedding shower goes well, please let us know if you have any questions. Hi! I have a school project and I would like to ask, what brand of sugar do you use for your mini-croissants and where is it produced. We’re excited about your project and would love to hear more about it. We don’t use a brand of sugar, as such, but currently we use only Cane Sugar. The details are proprietary so we can’t really say more than that, but maybe we can help in other ways if you tell us more. The grocery store in my country sale your mini croissants frozen; do you have any advise to defrost it? It is recommended to let them thaw at room temperature, they should only require 2 or 3 hours. Once completely thawed, Toufayan Mini Croissants should be coded for a 30 day shelf life. However, please look for a printed code date on the package. If there is one, it is possible that the product has been thawed and frozen again. If that is the case you shouldn’t freeze them at home, and they may require a little longer to thaw at room temperature. Also, the code date will be skewed by the extra freezing time. In freezing and thawing of all bread products, moisture and condensation can easily decrease the consistency and the flavor of the bread, so keep the packaging sealed and don’t use a refrigerator to thaw or store. the mini croissants imported to dominican republic usually taste soapy. any idea ? besides that, my family love them. We don’t officially ship to the Dominican Republic, your local grocer is possibly importing them via a third party shipper. It is possible that they are shipped after being thawed and among other products and goods, therefore they might be absorbing other flavors. It’s just as guess, as none of our shipping services reach your country. You might ask your grocer to see if they can be shipped frozen or at least sealed from other goods. I just wanted to say thank you. My partner is sensitive to malted barley flour, and these are one of the very few “dinner roll” type items I’ve ever found that doesn’t have any in it. It’s so nice to be able to serve these knowing that he can eat them without worrying about getting sick. I discovered them at Thanksgiving of this year and they will be gracing our table on a regular basis from now on. Thanks again! You are most welcome! We always love to hear from our customers. thanks for your response. I will share your recommendations with the supermarket. I just purchased two bags of mini croissants as I needed 48 for a reception. To my disappointment one bag had 22 and the other 21. I have purchased and used these for several years and have always had 24 as the package says. From now on I guess I’ll count! We are sorry for letting you down. We pride ourselves on quality and consistency and would like to look into this to make sure it doesn’t happen again. Do you by any chance still have the bags? Please let us know where you purchased these croissants. You can contact us directly at info@toufayan.com, or just reply here. Unfortunately, no one on your area carries our Mini Croissants yet. You can ask your favorite store’s manager to add our mini croissants to their inventory. They can contact us at info@toufayan.com or by calling us at 1-800-328-7482 directly. Johnny Pomodoro’s in Farmington Hills carries the mini croissants. what is the shelf life of your mini crousannts? Dee, our Mini Croissants should be coded for 30 days after store display.